I apologize for blogging about Buffy again, but I’m watching an episode now, and it is absolutely one of the best episodes of the whole series. In an attempt to not spoil anything, I will only tell you that it is toward the end of the 5th season, and it is the SADDEST episode EVER. I’m sure if you’ve seen it, you’ll know what I’m talking about. I haven’t cried this much while watching an episode of a tv show since…hmm…now I’m not sure. Maybe I’ll think of some later and will edit this post. What episodes of TV shows have made you cry? EDIT: I forgot to use my words to explain why this particular episode is so good. First of all, it’s visually stunning. Several scenes are in one-shot. Camera angles place characters to the side instead of centering on them. It’s like art. Secondly, the acting has never been better. EVERYONE from Buffy to Giles to Anya is INCREDIBLE. Seriously, when you watch this episode, you could not love these characters more. Thirdly, everything about the episode, from the dialogue to the characters’ actions, are perfect for the situation. It is a fabulous episode. Where I call “home”: Ioway! What part of BEDA I’m most excited about: Getting to read posts by Lindsay, Jill and Jen EVERY DAY! I’m glowing with nerdgirl knowledge. Why I’m doing BEDA: Lindsay threw down a sparkly gauntlet! and because I need to get back in the habit of posting efficiently and regularly. Like Jen said, it takes me f-o-r-e-v-e-r to write a post so this BEDA bootcamp should whip me into shape. Something other BEDA people might not know about me: Sometimes I wish I was a Trekkie. I have also never seen Buffy the Vampire Slayer (TV show– I actually used to watch the movie alot when I was little–totally backwards, I know) and I am DEEPLY ashamed of that. Another blog I follow: I used to REALLY like Readymade’s blog before they split it all up into different categories…now it confuses me and I just run and hide when I go there… (and I know you can just read the Editor’s Notes and it feels like a single blog–I’m slowly working up to that) But it was where I first discovered the Cordwainer’s Workshop which I will probably feature on the “cool wedding things I can’t afford” when I blog bridal-ly again. A writer (of any kind) who inspires me: Dodie Smith— combines loveliness and melancholy and nonsense and dogs and castles. Roald Dahl–just a little bit dark and utterly fantastic. A YouTube channel I love: um yeah, I rarely pay attention to channels, but I guess I would say MEG CABOT’s!!! So I wrote this post in like 15 minutes…and then I spent an hour trying to find some sort of related images to spice it up. Not gonna happen. will add extra spice tomorrow yum yum eastery spice! Several months ago I decided to rewatch the entire series of Buffy the Vampire Slayer. It all began because I wanted to watch TWO awesome episodes, but I figured it would be better to watch them in order to get to them. I finally hit the first one I’d wanted to see. Another aspect of the genious that is the Hush episode is the humor of the cast when silent. Xander, Giles, and Spike, especially, are all really great in this episode. Of course, they’re usually great in every episode, but in this one, they’re fantastic at making gestures or being sarcastic even without speaking. 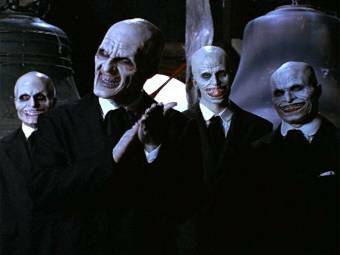 And finally, I just have to say that from what I can remember of the villains on the whole series, the big bads in this episode – “the Gentlemen” – are the scariest, creepiest villains on Buffy. What do you think? Have you seen this one? Now you see, I probably could have related myself to James McAvoy a little easier, but I just wanted to connect myself to a bunch of different cool people. 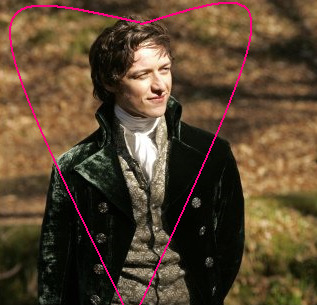 Mmm… James McAvoy. ** Added later: I think it is absolutely hilarious that I have 2 actual friend’s in common (on facebook at least) with Lucas from MoM, and not just Harry Potter friends. I don’t know about Drew (friend from high school), he might be into HP, but I’m pretty sure Nate (friend from college) hasn’t read a lick of HP (I could totally be wrong, but he’s super religious and strikes me as the kind of religious that doesn’t like books like HP, but is still nice about it). Mwuahhahahaha. John Deere.